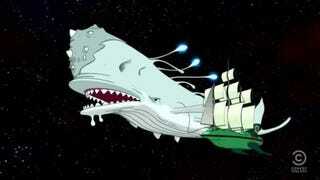 How Much Whale Oil Is There in Space? More Than You'd Think. This is a real question. Whale oil is a wonderful industrial lubricant and remains liquid at extremely low temperatures. It was almost certainly used in some NASA technology over the decades. But how much whale oil have we sent out into the cosmos? While it’s more likely that NASA currently uses synthetic lubricants meant to mimic whale oil, they probably did use whale oil at some point. Whales were endangered for a reason—everyone used whale oil. Whale oil was used almost exclusively as a lubricant from the beginning of the industrial revolution until the advent of petroleum, and even after oil became something we got out of the ground instead of something we harpooned, whale oil was simply better than most industrial lubricants. It makes sense that NASA would use the most effective materials it could find. Whaling is horrible to witness, and whales should be preserved. Still, if Vowell is correct, there’s something amazing about whales—even parts of them—being on the moon. But until we can create actual space whales, though, it’s best they stay intact and in the oceans.